To be clear, Neri is claiming a novel preparation technique for a chemical substance that was known since antiquity. I think it is quite reasonable to say that a particular personality trait led him down this path of discovery; his almost maniacal drive for purification. 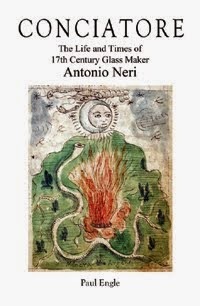 For a seventeenth century alchemist, it is a trait that served him well. Where other practitioners were content to use contaminated or substitute ingredients in their formulations, Neri always goes the extra mile in verifying his ingredients and using any extra filtering steps that might be warranted, no matter how time consuming. More than anything else this is what led him to such success in glass formulation, the assurance of exceptionally clear product and bright colors. You should make the sulfurs, vitriols, ammoniac salts, and similar materials slowly, over a low fire, so they are well prepared and well opened, because a violent fire will cause great damage to them. To begin, Neri cuts thin copper sheet into small pieces half the size of a small coin. filling a crucible, he layers the copper pieces with common sulfur (known as brimstone). He cements the vessel shut with a lid and then buries it in the hot coals of a drafted furnace for two hours. The dark purple contents are then ground and sifted through a fine screen, mixed with six ounces of pulverized sulfur per pound and then heated in a round terracotta pan, which is sitting in the hot coals. When the sulfur starts to burn, he stirs the mixture, rolling it into balls with an iron hook so it does not stick to the pan, continuing until it stops smoking. He removes the mixture from the heat, grinds it finely, adds more sulfur and repeats the entire process three times. Neri grinds the resulting reddish tawny colored material into powder, putting a pound of it into a large glass vessel containing six pounds of clean water and gently evaporate away a third of the water. The liquid is carefully poured off and saved. The residual solids are dried and recycled in the process. Now more solids are allowed to settle out of the "beautiful blue" liquid over a two-day period and then the liquid is filtered through a felt cone. He heats the liquid again, this time evaporating two thirds and then puts the remaining third into glazed terracotta pans, and leaves them in a cold damp place overnight. "You will find the vitriol of copper has formed into crystalline points that mimic true oriental emeralds." The crystals are removed, dried and the liquid is further evaporated in order to obtain more crystals. 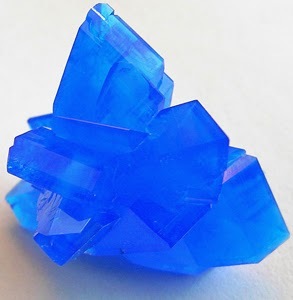 To the chemist, this material is copper sulfate pentahydrate ; today it is sold inexpensively as a fungicide for swimming pools. One reason it was so valuable to alchemists is that when gently heated or added to water this chemical forms a sulfuric acid solution. This is the true flaming azure blue [tincture], with which marvelous things are made. It is most potent, and as sharp as anything known in nature today, as can easily be perceived from its odor. Although I have placed here the way to make this powder with much clarity, do not presuppose that I have described a way to make something ordinary, but rather a true treasure of nature, and this for the delight of kind and curious spirits. * This post first appeared here on 29 Aug 2014.